Experience the beauty and simplicity of the bush, its surrounds and sounds, with an abundance of birds and wildlife. Take in the beautiful view of the Blackall Range's rolling hills and forests, walk to the scenic lagoon, or stroll through the abundant food gardens. Conveniently located in the beautiful Sunshine Coast hinterland, Bellbunya is nestled at the entrance to the Mary Valley, 11 kilometres from the Bruce Highway and Eumundi, famous for its markets, heading toward the scenic township of Kenilworth. Bellbunya is 90 minutes from Brisbane, 25 minutes from Noosa and 40 minutes from Maroochydore on Tourist Route 10 (Eumundi-Kenilworth). Cick here for directions. Visit us for a few days or a week or two. Our comfortable ensuited rooms are affordable and meals shared with the community healthy and friendly. Go to Come Visit for more information and to make a booking enquiry. Bellbunya has well equipped conference, accommodation facilities and delicious onsite catering. We welcome the opportunity to share these with like-minded groups and individuals. We cater for one function only at a given time so, for the length of your stay, your group is sole recipient of our community's hospitality. 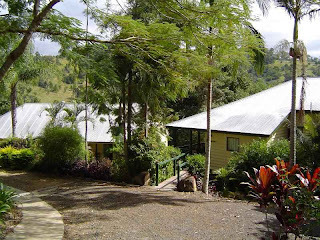 Although Bellbunya was originally configured as a conference centre with a large capacity, it now is fundamentally an intentional community, which happily is able to host small residential gatherings whose purpose closely aligns with our goals of sustainability, holistic health and social change. We now have quite limited accommodation for outside groups. We can generally host groups of 12-16 people overnight in a combination of ensuited twin rooms and multi-share rooms. Slightly larger groups may be possible - please send your enquiry and we will discuss the options. The hall's open plan design accommodates a range of layouts to suit small or large groups. The excellent acoustic properties assist ease of interaction between guests and presenters and makes the hall ideal for music events, Powerpoint presentations, group-work, yoga or physical movement workshops and cinematic viewing. For day use, our large conference hall, is in an historic former church, surrounded by sub-tropical gardens and break-out space. Equipment available includes comfortable, padded seating for up to 70 people, ceiling fans and (limited) reverse cycle air-conditioning, tables, surround sound system, DVD, CD, IPOD/Mp3 input, data projector, a 4.5 metre cinema screen plus a 2 metre movable screen, whiteboards and kitchenette. Our dining room and commercial kitchen can cater for up to 60 people. We provide healthy, garden fresh meals (primarily organic and vegetarian) in our dining room and can provide a menu to suit. You are welcome to use our on-site catering or provide your own. A 40 acre ex-dairy farm, Bellbunya features traditional Queenslander-style buildings that have been integrated in a way that recreates a village atmosphere. Our heritage accommodation buildings include a church and a post-war hospice that have been relocated to Bellbunya. Our gardens and surrounding areas abound with native flora and fauna. Grounds are well established with trees, shrubs, ponds and walking paths. Mornings echo with the calls of kookaburras, cockatoos, whip birds, currawongs, galahs and lorikeets. Experience the beauty of sunrise over Mount Eerwah from the abundant vegetable gardens. Enjoy relaxed walking or jogging on quiet country roads that adjoin our property. Take a walk to our lagoon or just relax and soak in the slower pace of life. As a not-for-profit organisation we are able to channel the proceeds from our facilities into fostering community development and improving sustainability for Bellbunya and the wider community. Please discuss with us the possibility of negotiating prices for longer stays for our Association members and for groups that are working toward similar ideals as us. We encourage group bookings of 8 and more. We cater for only one group at a time, so that you will have access to the conference hall and dining room for the length of your group’s stay without competition for guest facilities. Bellbunya is located at the centre of an environmentally and culturally diverse region, with natural forests, markets, beaches and farming communities. The Sunshine Coast region lies within one of the most biodiverse areas of Australia. The region contains an extensive range of ecosystems that support plant and animal species of international, national, regional and local significance. The Noosa region is the first internationally recognised biosphere in Australia. The Sunshine Coast Regional Council has a mandate to make the Sunshine Coast ‘Australia’s most sustainable region – vibrant, green, diverse’. In support of these aims, we are actively working to make Bellbunya into a sustainable venue, through projects such as our renewable energy project, insulating existing buildings, energy efficiency projects and modelling sustainable community. We are currently working on creating a sustainable master plan and permaculture plan for the site. Future buildings on-site will incorporate sustainable materials, small building designs, passive solar and other eco-design elements. Catering for conferences and events is based on sustainable practices, such as growing food on-site, buying local and organic produce, minimising packaging and waste reduction, reuse and recycling. Bellbunya is owned by the Association for Sustainable Communities Inc, a not-for-profit environmental organisation established in 2007 to build and model sustainable communities, and to teach and learn holistic sustainability. 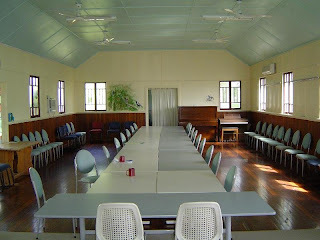 The Eco-Conference Centre is managed by the Bellbunya Community Association as a not-for-profit enterprise of a model 4-bottom-line sustainable community. Income from the venue is directed toward our aims of creating a sustainable future, environmentally, socially, economically and spiritually/culturally. * Bell - Belli Creek, the headwaters of which start on Bellbunya, a tributary of the Mary River. "Belli" is derived from an indigenous word for the pre-historic Lung Fish found only in the Mary River and the Mary Valley. * Bunya - for the Bunya Pine trees (Araucaria bidwillii) that are native to the area and was a staple annual food source for Aboriginal communities. "Bellbunya" was the name of the original dairy farm on this site, and the old gate sign is now afixed by the front door of Bunya House.